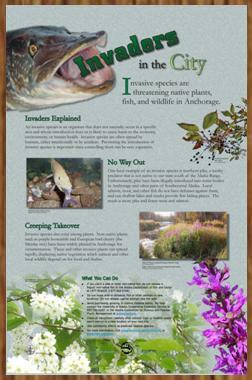 Invasive species are threatening native plants, fish, and wildlife in Anchorage. An invasive species is an organism that does not naturally occur in a specific area and whose introduction does or is likely to cause harm to the economy, environment, or human health. 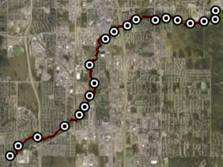 Invasive species are often spread by humans, either intentionally or by accident. Preventing the introduction of invasive species is important since controlling them can be very expensive. One local example of an invasive species is northern pike, a toothy predator that is not native to our state south of the Alaska Range. Unfortunately, pike have been illegally introduced into water bodies in Anchorage and other parts of Southcentral Alaska. Local salmon, trout, and other fish do not have defenses against them, and our shallow lakes and creeks provide few hiding places. The result is more pike and fewer trout and salmon. Invasive species also exist among plants. Non-native plants such as purple loosestrife and European bird cherry (the Mayday tree) have been widely planted in Anchorage for ornamentation. These and other invasive plants can spread rapidly, displacing native vegetation which salmon and other local wildlife depend on for food and shelter. If you catch a pike or other non-native fish, do not release it. Report non-native fish to the Alaska Department of Fish and Game at 1-877-INVASIV (1-877-468-2748). Do not move wild or domestic fish or other animals to new locations. Do not release captive animals into the wild. Avoid purchasing, growing, or sharing invasive plants. For help contact the University of Alaska Cooperative Extension Service at 907-786-6300, or the Alaska Committee for Noxious and Invasive Plants Management at www.cnipm.org. Clean all equipment carefully after outdoor trips so invasive seeds aren't carried to a new location on your next trip. Join community efforts to eradicate invasive species. For more information, visit www.muni.org/salmoninthecity or www.muni.org/parks.